Preheat oven to 325°F. Line and grease a 9×9 square pan. Make the crust: Mix graham crumbs, melted butter, and 2 tbsp. of sugar together. Press to the bottom of the greased pan. Make the filling: Beat the cream cheese for about 2 minutes or until creamy. Gradually add sugar until well combined, scraping sides of bowl. Add the eggs one at a time and then stir in vanilla and ½ cup of dulce de leche. Pour filling on top of crust and bake for 35-40 minutes, until the centre no longer jiggles. Let cake cool in pan for 30 minutes, then let cool completely in the fridge. 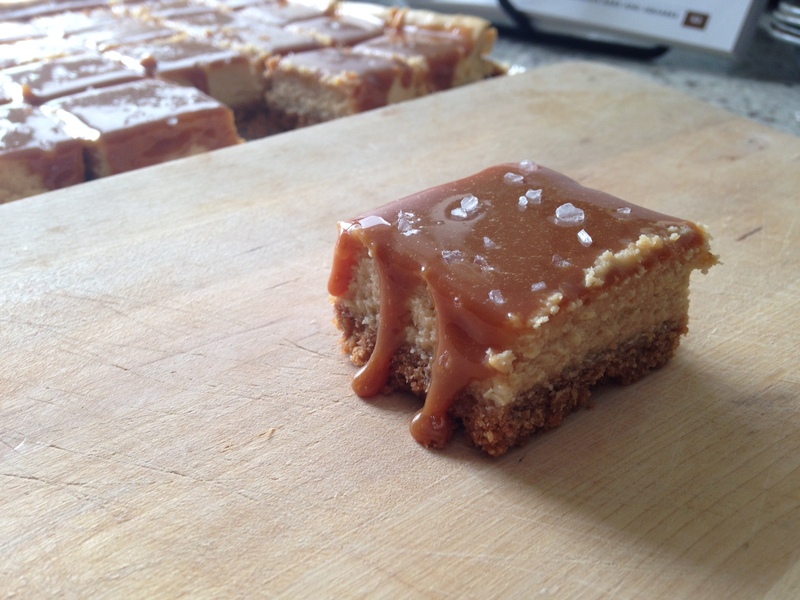 Make the topping: Using a heatproof liquid measuring cup, add liqueur to remaining ½ cup of dulce de leche and heat in microwave in 10 second intervals, stirring in between. In a separate bowl, heat soft caramels in the microwave until mostly melted, then add to the dulce de leche mixture and stir until the caramel sauce thickens. Pour over cooled cheesecake and sprinkle lightly with sea salt. Keep refrigerated until served.